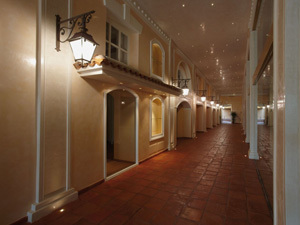 to meet the wide-ranging requirements of those who want to organise conferences in a prestigious historic venue that is highly architecturally impressive, savour the dishes that encapsulate the culinary traditions of Alghero, stay in exclusive apartments with stunning views over the Capo Caccia promontory, visit exhibitions and sample a range of dishes and aperitifs in the bar located in the central square. 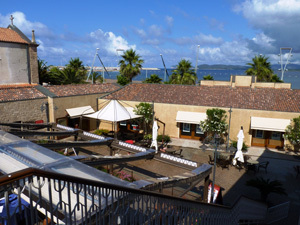 The name of the complex is derived from the local dialect of Alghero, with its strong Catalan influences. the term actually means (religious) "habit". the centre of the oldest part of town. all of the town's main attractions on foot. 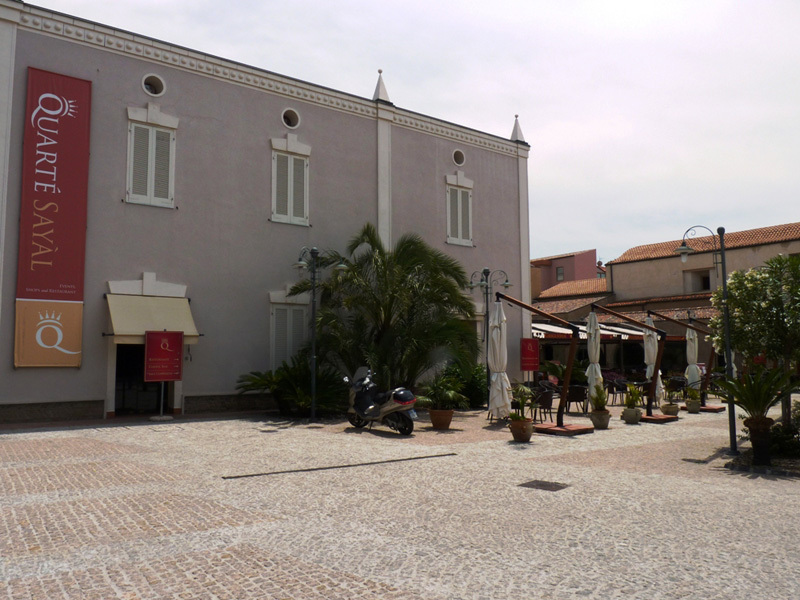 a bar and several shops, they constitute a great place for those visiting the city on business – as well as for Alghero's own natives and their guests – to come together and do business. Discover the spaces that are still available and contact us to arrange a meeting. The first friary was founded in 1595 in an area close to the location of the current prison. The Capuchin fathers inhabited it until 1714 – the year in which Philip V forced the friars to leave, since the friary's location constituted a grave danger for Alghero's city walls. 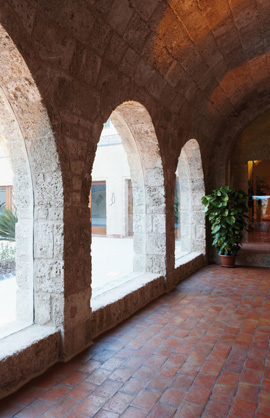 Thus, in 1719, the friary was demolished, before being promptly rebuilt along the coast in 1722.
in the characteristic Catalan-style rounded-arch vaults that today give the Maò de Plà Restaurant its name. Between 1855 and 1866, the Italian State implemented a policy of confiscating properties belonging to the Church that could be sold off in order to rebalance the books. 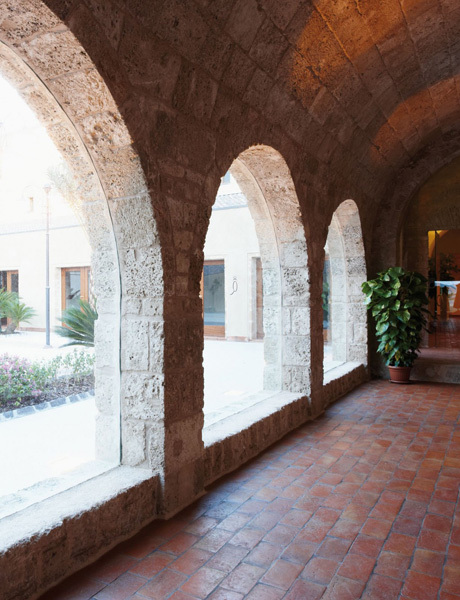 It was during this period that the building's use was changed from religion to industry: in 1902, the Sella & Mosca winery purchased the former friary from the Municipality of Alghero for 3,500 lire. This decision was taken by the winery with a view to exploiting the site's strategic position: the new railway linking Alghero to Sassari passed directly in front of the building. As the headquarters of the Sella & Mosca winery for 70 years, the building underwent substantial modifications. to the religious architecture of Alghero. In 1961, the winery's days of being a family-run concern came to an end as it was acquired by a group of Lombardy-based shareholders. of the vineyards. The change was motivated mostly by financial considerations: road transport became more economical than rail in the 1960s, and the market at the time was becoming more dynamic, requiring a more streamlined, functional facility at the source. In 1974, the former friary was acquired by the Ferroni family. In 2004, the family commissioned large-scale renovation works, under the supervision of architect Luciano Bebbere, which would eventually lead to the creation of Quarté Sayàl. The Ferroni family have been in business since way back in the 1940s, when Arnaldo – grandfather of the current generation – set himself up in the home furnishings industry. In 1965, his sons Roberto and Aurelio continued the family's entrepreneurial tradition by investing in the tourism industry. all of whom contributed to the project that resulted in the Quarté Sayàl development.